I'll still be posting about tasty, healthy food along with some other fun things. Hope to see you there! Despite my resolution to blog more in 2013, I'm not finding that to be possible right now. I still love cooking and eating and sharing recipes, but at this time I can't find enough minutes in the day to write about those things. Therefore, I am putting this blog on a hiatus...hopefully not a permanent one, but one long enough to allow me to finish some other projects that need attention (for instance, 6 years worth of photos that still aren't in albums). Before I depart, I'll post a few awesome recipes I've made recently, and will definitely be making again. Chop up some green cabbage and raw kale into small strips. Mix in your favorite caesar dressing (store bought or homemade). Refrigerate for an hour or so before serving to allow the kale to soften a bit. Serve! For some reason I've been incapable of making a salad since we moved to the east coast. Actually I do know the reason....it's cold here, and when I'm cold I want to eat warm things. I will probably get over it eventually (just like I learned to enjoy chili in Arizona even when it was 90 degrees outside), but for now I'm just not feeling the salad thing. That's why this recipe from Food Network magazine seemed like a winner. I've made, bought, and eaten plenty of pesto before, but because this recipe calls for pesto made from arugula and almonds, it occurred to me that pesto is basically like a salad thrown in a blender. Or like a shot of salad. Either way, it's taking lots of the healthy stuff I haven't been eating enough of and putting it into a form that is yummy and winter-friendly. And because the recipe includes tomatoes, green beans, and pasta, it is a fantastic well-rounded meal. Obviously you could just make the chicken and pesto, and serve it with a different side dish, but the lazy side of me loved that it was a recipe for a whole, well-rounded meal and I didn't have to spend time figuring out a side dish. Plus, the extra pesto tastes great with the veggies and pasta so it all comes together nicely. The other reason I like this arugula pesto is that it's a great way to use up arugula and almonds that you might already have sitting around your house. My issue with making homemade pesto has always been that fresh basil and pine nuts are so expensive, unless you grow your own basil. So this seemed like a cheaper alternative, and was every bit as delicious as regular pesto in my opinion. You'll notice that I used cherry tomatoes instead of roasting regular tomatoes...that was just because I had them on hand and didn't feel like going to the effort of roasting tomatoes. But I bet the roasted ones would be yummy. Chicken with Arugula Pesto (and green beans and pasta and roasted tomatoes). Bring a pot of salted water to a boil. Add the pasta and cook as the label directs; about 3 minutes before the pasta is done, add the green beans. Drain the pasta and beans and rinse under cold water. Toss with half of the cheese, 1 tablespoon olive oil, the lemon zest and salt. Preheat the broiler. Puree the arugula, parsley, nuts, lemon juice, 3 tablespoons water, the remaining cheese and 1 tablespoon olive oil, and salt to taste in a food processor. Transfer to a bowl. Place the chicken breasts between two pieces of plastic wrap and pound to about 1/2 inch thick. Transfer to a foil-lined baking sheet and season with salt. 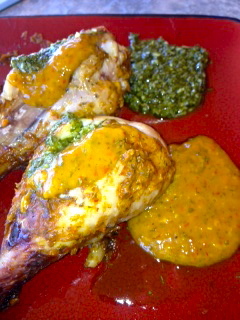 Rub all over with 1/4 cup of the arugula pesto and broil, turning once, until cooked through, 4 to 5 minutes per side. Arrange the tomatoes cut-side up on another baking sheet and broil 2 minutes. Spread each with some pesto and sprinkle with the breadcrumbs. Broil until golden, 1 more minute. Serve the chicken, tomatoes and pasta salad with the remaining pesto. Trader Joe's pulled pork taco...to the rescue! Wow, I can't believe August 13th was the last time I posted! I do have an excuse, and it's a good one. We moved across the country, and I have been in a whirlwind of unpacking boxes, buying furniture, returning furniture because I realize it's ugly when I get it home, navigating new and twisty city streets, learning to deal with mean city drivers, and just generally getting acclimated to life in Pennsylvania after six years in the desert. One thing that was the most stressful about this move was getting back into a cooking groove. Not only did I have to throw away a ton of my staple ingredients and re-buy everything, but I also had to get used to a completely different kitchen set-up. I still have to open at least 2-3 drawers before I find what I'm looking for, but for the most part my kitchen is now stocked and organized, and I'm ready to get back into cooking with a vengeance! I'd like to kick off the new East Coast edition of Quinoa and Corn Chips with a recipe that was a lifesaver on a day I really needed one. It was a cold, gray, rainy day (there are lots of those here, I'm noticing), and I was trudging through Trader Joe's, craving a warm comforting dinner without a clue about what I wanted to make. Usually I have at least an inkling of something in mind...a certain meat I've thawed out, or a veggie I need to use before it goes bad. But on this particular day, my mind was completely blank. Pour the can of tomatoes into your crock pot. Add the pork loin, next toss in the rest of the ingredients. Slow cook on high for 3 hours, then cook on low for the next 4-5 hours. Remove the pork loin and shred. Add the pork loin back to your crockpot so the meat can absorb the juices. Serve in a tortilla with your favorite toppings, or simply serve with Cuban Style Black Beans and Rice. Enjoy! *Obviously they are promoting their own canned tomatoes, but any diced tomatoes will do. I took home my ingredients, dumped them in the crockpot, and had delicious pork tacos that night. As always, I have a few personal notes about the recipe. 1) The total cooking time is about 8 hours (not counting the shredding), so make sure you plan accordingly. If you don't start them until 3 pm, you'll be in trouble! 2) I chose to use hard shells instead of tortillas. Whatever you choose, just don't forget to buy the taco shell because it's not on the ingredient list. That's something I'd typically do, so I wanted to point it out. 3) The flavors in this recipe were fantastic, but one key ingredient was left out: salt. Make sure you season it thoroughly with salt before serving. And if you'd like to spice it up, you could also add diced chiles, jalapenos, or chipotle peppers...totally up to you. 4) The other thing that was left out was the fat removal. I have a huge issue with fatty meat, so I made sure to scrape off and discard all the visible fat after the meat was cooked, and only put the lean shredded pork back into the pot. There are many factors to blame for my post-slacking, but the most prominent one would have to be a case of the blahs in terms of finding exciting new recipes that are both delicious and fairly healthy. But now...well, that's all over. Because summer is here! I've discovered that, despite the sometimes brutal heat, spring and summer are my favorite times of the year for making meals. The heat brings out a natural inclination to eat fresh, nutritious foods (who wants a heavy, creamy, cheesy fried thing when it's 110 degrees outside?). And the stores and farmers markets are stocked with colorful fruits and vegetables that are just begging to be bought and experimented with. To kick off what I hope will be an abundance of awesome summer recipes, I offer my new favorite veggie dish. Isn't it lovely? And the best part is, it's super simple and easy to prep ahead of time, which makes it BBQ or potluck friendly. Saute the onion in olive oil until soft. Add the garlic and cook until fragrant (be careful not to burn). Spread the onion and garlic mixture onto the bottom of a 13x9 inch casserole dish (if you want to make less, use a 8x8 square pan). Season the tomatoes, squash, and zucchini with some salt, pepper, and (if you like), some italian seasoning or dried oregano. 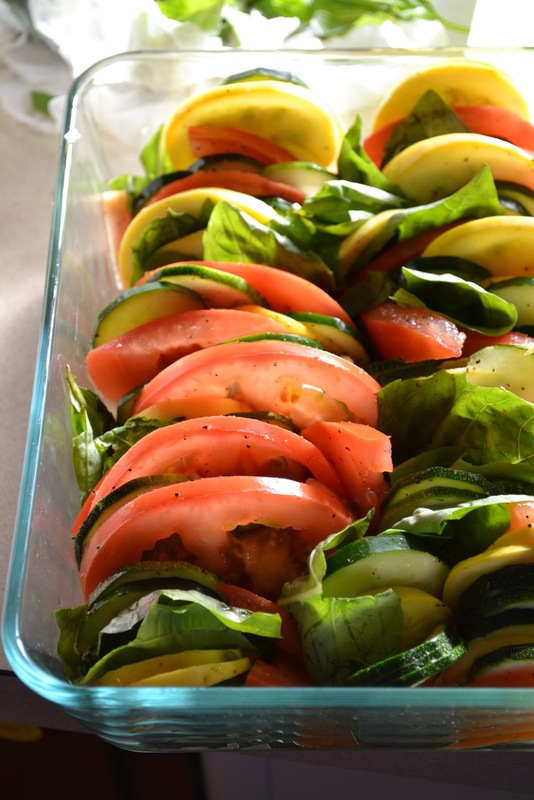 Stack the veggies on their edges, alternating between the squash, zucchini, and tomato. Once the pan is full, tear off the basil leaves and poke them down in between some of the veggies (use as much or as little as you want). Cover the pan with aluminum foil and bake at 400 degrees for approx 30 minutes, or until the vegetables are tender. Remove the foil and sprinkle mozzarella cheese over the whole pan, spreading evenly. Put the pan back in the oven and cook until the cheese is melted and bubbly. You may want to turn on the broiler to get that nice brownish crust on the top of the cheese. *I haven't tried this yet, but it just occurred to me that this might be really good served with a little warm marinara sauce spooned over the top - especially if you're serving it to kids. And secondly, I offer you a link to a cherry tomato salad I recently made, which was also delicious, light, easy, and BBQ friendly. When my husband saw the recipe lying on the counter, he said "Buttermilk? That's not light." Oh, but it is! Thanks to my obsessive Food Network watching, I know that buttermilk is very low in fat. The reason it's called buttermilk, is that it's the residual liquid left over after butter is churned. The dressing on this salad tastes like ranch, but is much lighter while still remaining totally natural (unlike the "lite" version of most ranch dressings). It's been a while since I've made a blog-worthy meal, and it's also been a while since I've made anything worth mentioning in a crock pot. I have a bit of a love/hate relationship with crock pot meals. Obviously the idea of throwing a bunch of stuff into a pot in the morning, and having a delicious meal all ready and waiting at dinner time is a wonderful one... But usually all of the crock pot recipes I make turn out to be riffs on mushy meat stew in some sort of a tomato-based sauce. I was excited when I saw this recipe for Alton Brown's slow cooked pork chops featured as the "Recipe of the Day" on the Food Network website. For one, I'd been making so much chicken lately that my whole family was really chickening out (Sorry, I heart cheesy puns). Secondly, it was something unique, unlike typical crock pot fare. This recipe was super flavorful, and really tender. Pork chops can tend to be dry and flavorless, and these were just the opposite. I do have to warn you, this dish is pretty labor intensive, as crock pot dishes go. First you have to brine the pork chops overnight (not a big deal, but it takes some advance planning). Secondly, you have to spend probably 30-45 minutes the next morning browning the pork chops before they go into the crock pot. So if you're looking for something where you can just dump some stuff into the crock pot and turn it on, this recipe isn't for you. But if you're looking to make a delicious, guest-worthy meal that you can prepare well ahead of dinner time, then you need to try this. Note: Make sure you buy fairly thick, bone-in pork chops for this dish. And go ahead and make more than you think you'll need...the leftovers are fabulous too. Another note: Some of the reviews on the Food Network website mention that the dish is too salty/peppery, but I disagree. I made it exactly as directed and thought the flavor was spot-on. Then again, I do love me some salt. If you're not a big salt fan, you can tone it down by using water or some wine in place of the chicken broth at the end. Combine the broth, salt, brown sugar, and peppercorns in a medium sauce pan over medium high heat. Cook until the salt and sugar dissolve, and remove from heat and add the ice. Place the pork chops into a large ziplock bag and pour the mixture inside. Seal and refrigerate overnight. In the morning...remove the chops from the brine, rinse and pat dry. Season on both sides with kosher salt and set aside. Place the apples in the slow cooker. Heat 1 1/2 tsp of the olive oil in a large saute pan. Over medium high heat, sear both sides of the pork chops until golden brown, about 5-6 minutes per side. Once browned, put the chops into the crock pot atop the apples. Add the remaining olive oil to the pan and saute the onions until soft and beginning to brown. Add the chicken broth to the pan to deglaze. (I used a little bit of white wine to deglaze, and then added the chicken broth). Add the black pepper and thyme. Transfer to the slow cooker. Set to high for 1 1/2 hours, and then turn to low. Continue cooking another 4-5 hours or until the pork is tender and falling away from the bone. *If you're not going to be home to turn down the crock pot, just set it to low the whole time. These chops would go great with just about any side dish you can think of. The sauce would be great to soak up with some rice, roasted potatoes, cauliflower, etc.